Deaths of infants and children dropped rapidly over the last 25 years. The number of deaths of children under five fell from 15 million in 1980 to about 11 million in 1990, a period when the number of children being born was still rising. This was success borne on many wings vaccination programs, the spread of oral rehydration therapy, wider availability of antibiotics to treat pneumonia, and better economic and social conditions all contributed. At the end of the 20th century only 36 developing countries were making fast enough progress to reduce under five child mortality to a third its 1990 level by 2015. Most of those are middle-income countries, although a few poor countries notably Bangladesh and Indonesia and some of the poorest countries of the former Soviet Union are on track to achieve the goal. In some parts of the world vaccination coverage has even begun to decline. In 1999, 55 countries had not attained 80 percent coverage of measles vaccinations among children under one year; another 48 reported no data. To ensure continuing improvements, disease specific vaccination and treatment programs must be sustained, while new strategies address unmet needs of unserved populations. In all countries, the poorest are least likely to receive health services and so have the highest mortality rates. Addressing the underlying causes of poverty will improve health, and better health will reduce poverty. South Asia, with the lowest GNI per capita of any region, has the largest number of people living on less than $1 a day. But since 1990 it has experienced rapid growth, averaging 5.6 percent a year, which has helped to reduce the poverty rate substantially. The ability of the region, especially India, to sustain average growth of 5-6 percent a year will be critical to achieving the poverty reduction targets for 2015. Poverty data in India are subject to considerable uncertainty. Its private consumption, as measured in the national accounts, grew about three times faster in the 1990s than household consumption, as measured by the National Sample Survey. Discrepancies are to be expected, as the two sources track different aggregates. Moreover, the survey data tend to understate the consumption of higher-income households. But the size of this difference and the slowness of poverty reduction revealed in the survey data are difficult to account for, particularly given the improvement in human development indicators, so more accurate data could indicate faster poverty reductions than our current estimates. The region has had some success in reducing mortality in children under five since 1990 (from 120 to 96, per 1,000), especially in Bangladesh (136 to 83, per 1,000). 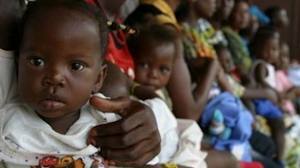 At the same time, little progress has been made in reducing malnutrition. Today, nearly half of all children under the age of five are malnourished. It also has the highest rate of youth illiteracy―23 percent for males and 40 percent for females―and, at 37 percent, the lowest rate of access to sanitation facilities. The resurgence of tuberculosis and the threat of HIV/AIDS are also a cause for concern.